A novel with biblical resonance. 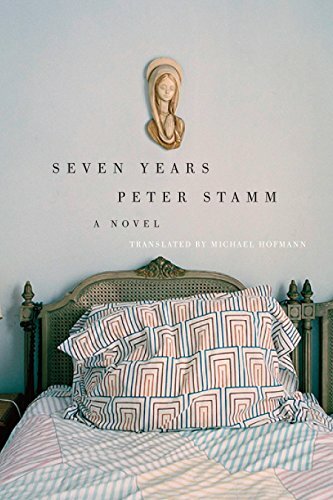 Several reviewers of Swiss novelist Peter Stamm's latest novel assumed its title referred to a certain "itch" now synonymous with Marilyn Monroe's billowing white frock. Seven years after the wedding, so the axiom goes, is when the married eye, weary of monogamy, begins to wander. But Seven Years is no mere tale of philandering—something else is going on here. At a beer garden one day, lazy architecture student Alex meets Ivona, a girl he finds repulsive in her dowdy dullness. But, succumbing to the age-old mystery that is youthful hormones, he sleeps with her anyway—and then, to his own consternation, keeps coming back for more. Like many young people, Alex is starting to "admit to myself that I wasn't the genius I always dreamed of being," but with the inferior Ivona, he feels uninhibited, masterful, affirmed. Ivona may be ugly and fond of telling unconscionably boring stories about saints, but she is slavishly devoted to Alex, living only for the times he shows up in her sad, small rooms, consumed by lust and self-disgust. Yet Ivona is Alex's dirty little secret, and so he pursues and eventually marries Sonia, a friend from architecture school, who is everything Ivona is not—the sort of clever, vivacious beauty who fearlessly wears white to restaurants and beaches and thoroughly intimidates Alex with her aloof ambition. This relationship, too, is a bit of a mystery; Sonia seems to regard their partnership—in business and marriage—as founded on convenience more than anything too much like love, or even mutual respect. Alex stops seeing Ivona for a while after marrying Sonia, but the fateful seventh year arrives and, again feeling inadequate and insecure, he falls back into her life. To nobody's surprise except Alex's, life with a frigid wife and repulsive mistress is not much fun. They remind him of parts of himself he'd rather ignore: his indolence, mediocrity, and mean-spirited passivity. So when he sees a way for Ivona to materially benefit his life, he barely hesitates before cruelly depriving her of the one thing he's ever given her. The critics who pin the story on a seven-year itch aren't wrong, exactly, but they might be missing the forest for a single tree. (Tellingly, in an interview with his publisher, Stamm sidesteps a question about Billy Wilder's film entirely.) It's not Monroe but rather the Genesis ghosts of Jacob, Leah, and Rachel who haunt this narrative—reconfigured and updated for contemporary Europe. Ivona is Leah: despised and neglected by the man who gives her life meaning, but possessing one serious advantage over her beautiful, barren competitor. Bilhah and Zilpah, the Genesis story's servant girls who bear children for their mistresses, are also compressed into the great tragedy of Ivona's life. And the title? Of course, seven years Jacob worked for Rachel, only to receive Leah; seven more years he worked for the woman he loved. This version is less noble, more depressing: in the center of the narrative, Ivona's friend Herr Hartmeier tells Alex, "She's waited for you seven years, the way Jacob waited for Rachel." Alex barely remembers the story but recalls its outlines as Hartmeier continues, "Whether she waits for you a year or seven or fourteen, makes no difference …. It's like the love of the Savior, it doesn't get any less over time, in fact the opposite." Ivona is a sort of pitiable secular saint: though fonder of self-inflicted martyrdom than true sacrifice, she does, at least, stick to her chosen course, tragic circumstances be damned. Her choice to remain devoted to a cruel man is delusional, but she is certainly a model of hyper-romantic perseverance. Is Stamm intentionally echoing the ancient tale of love and jealousy and tragedy? Or is the Genesis story an archetype, to be repeated for millennia? Hard to say. But to think of Seven Years—or of both stories—as only about attraction and adultery would be to miss the larger, far too familiar story of the cruelty we inflict on one another when we are lustful, or lonely, or simply blind. Alissa Wilkinson edits Comment and teaches English and humanities at The King's College in New York City. Her articles and criticism appear in Christianity Today, World, and other publications.